Gelman goes on to share one example of how to collect innocuous non-identifying data (e.g. 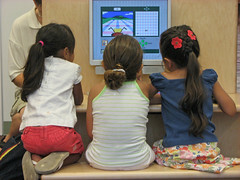 grade level) without triggering children’s anxieties about sharing personal information. The lesson is clear: know your users. At Virtual Home we’ve had our share of healthy differences of opinion on best practices for web design. At web design blog Line25, they break down both sides of the argument for the Top 5 Web Design Debates That Cause the Most Riots. Should a site should be viewable in IE6? Last month we launched our new home page. We pondered about what content should be above the fold, and how the new design will play out using different browsers. At that time, I did not know about the new tool Browser Size launched by Googlelabs. Browser Size makes it possible to test how others view our page, taking in account different sizes of monitors, browsers that are not always full screen and toolbars. It looks like a helful tool to save time during testing across browsers.